My family loves soft dinner rolls. When it comes to breads, they like to eat soft breads. Dinner roll is a versatile bread. You can eat it almost any time of the day. They can make great quick sandwiches, can be eaten with jam or butter. You can top it with cheese or herbs. I like to eat mine with tea. Tea? yes!!! you know when the kids are gone to dream land, I make a nice cup of tea and eat 2, 3 or may be 6 dinner rolls with tea. Well if you have kids, you won’t judge me but if you are single or don’t have kids yet, you are welcome to judge me, I won’t mind…Promise! 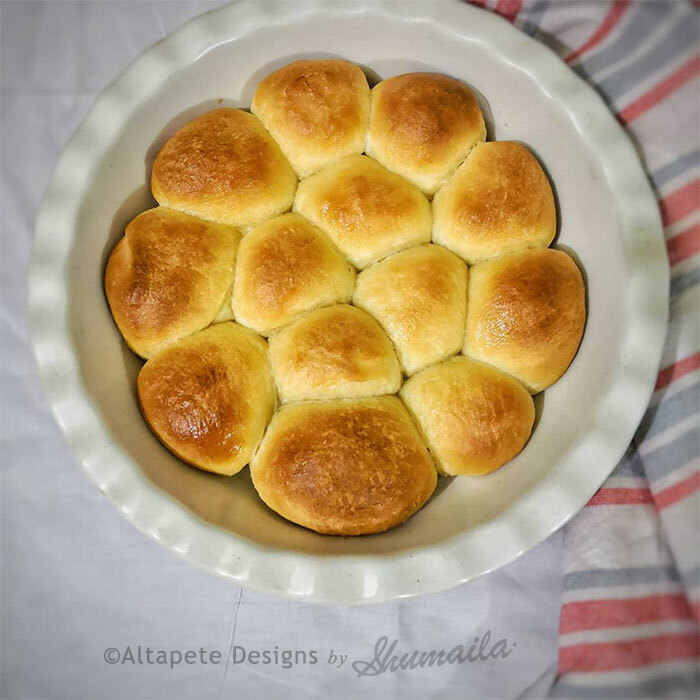 I tried this amazing recipe from Just a Taste of Easy Homemade Dinner Rolls. The recipe uses volume measurement but I converted the recipe to grams for consistent results. I cannot stress enough always use digital scale to weigh your ingredients to avoid mistakes and failures. 120 grams whole milk plus more for brushing before baking the rolls. 28 grams unsalted butter, melted, plus more for brushing after the rolls are baked. In the bowl of a stand mixer fitted with the dough hook, add 1 cup of the flour, yeast, whole milk and melted butter, salt and beat for 2 minutes. Make sure you add yeast on one side and salt on other side. Lightly flour your work surface. Scrape the dough onto your work surface, and using the heel of your hand, knead it for 2 minutes then place the dough in a greased bowl and cover the bowl with a towel. Place the bowl in warm place for 30 minutes until it has doubled in size. Grease an 8-inch round pan with cooking spray or butter. Divide the dough into 12 pieces then roll each piece into a ball and arrange the balls in the prepared pan. Cover the pan with a clean kitchen towel then return it to warm place for 30 minutes. Preheat the oven to 375°F. Uncover the rolls and brush them with milk (this will give your rolls beautiful golden brown color) then bake them for 20 to 25 minutes until they are golden brown and cooked through. Remove the rolls from the oven, brush them with additional melted butter (this will make the rolls crust soft and will make rolls more flavorful). Serve them warm. If you want to prepare the rolls in advance, follow the directions up until you place the (unbaked) rolls in the baking pan then tightly cover the pan with plastic wrap. 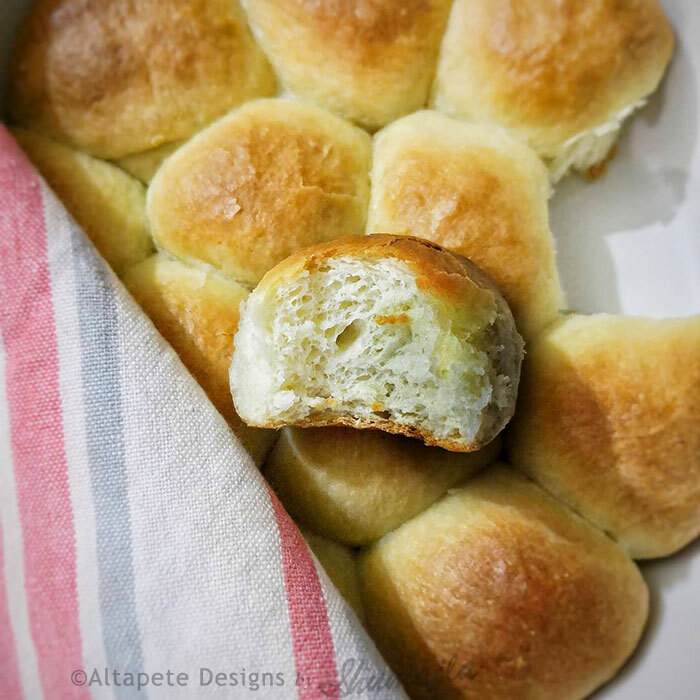 When ready to serve, remove the rolls from the freezer and place them in the fridge overnight then bring them to room temp to rise before baking them as directed.